YOUR GAME RESTARTED TO LEVEL 1!!! PANIC!!!! AAAAAAHHHH!!!!!!! There really is no reason at all to panic. Honestly. You actually will run into this from time to time. There is no reason to worry at all. A few basic steps or a lil time and you will be back up and running just fine. Just remember, we are here to help out and walk you through it the best we can. The biggest thing to remember is to NEVER CREATE A NEW GAME! If you do, you will lose all you have worked for. Just follow our helpful steps below to recover your game. First, check to make sure you are actually still logged in to your game. Sounds silly, but it does happen. From time to time our device manufacturers send out updates that may cause a reset to our device we are unaware of or don’t notice. Also, you may have uninstalled/reinstalled the game or cleared the data creating the log in info for your game to be lost. Not a problem. You just have to log back in. On the Splash Screen you should see an option in the lower left corner to login to your game or your username. If you see the option to log in it means at some point you were logged out. Just tap on it, enter in your email and password, and then you should be back to normal again. Now there will be a time or two that the option to log in from the Splash Screen won’t be available. Just a spinning donut (or like below, just a spinning donut and load screen after a reinstall). You can try to restart your device or try an uninstall/reinstall again, but the Login option may still not come up. Still don’t worry. Just a lil bit of time and some tapping and you can log in another way. From there, tap on Bart and Milhouse again and you will see the pop up info for the neighbor management. Look to the bottom right corner for the option to “Add Origin Friends”. Tap on it. You will now be able to get into the log in screen. Just put in your email and password and you should be back to your game again. Of course the EA help forum has a post on all this from a while back you are welcome to also take a look at HERE. Now there are a few methods in contacting EA. You can open a ticket by submitting the details of your issue, email, live chat, or…even call them. The steps were in my prior post HERE. Now to go hide by my corner and wait while that cute geeky nerdy guy with the crooked smile walks by. Maybe he will notice me this time. 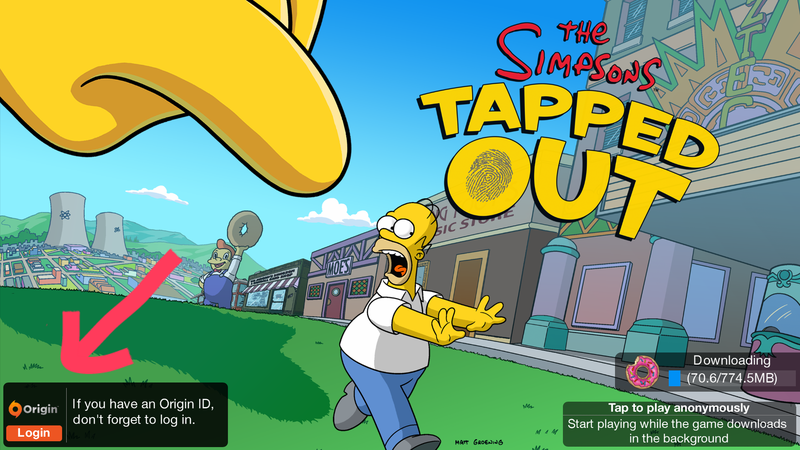 This entry was posted in Glitches, Tips and Tricks, Troubleshooting and tagged Can't Log into my game, Game went to Level 1, Log in screen is gone, My game restarted, The Simpsons Tapped Out. Bookmark the permalink. my game wasnt reset, and i have an ea/origin acct. but my money was reset, right after hitting $1,000,000 for the 1st time… im chatting with support now… so far they say they’re aware of the problem…. I played anonymous for 3 years. Had to do a factory reset on my iPad tonight. Everything is gone. Am I out of luck after all that time? Requests or notifications? Requests like for neighbors? I spent ALOT of money in this game and now it’s all gone. I didn’t have an EA login so I played anonymously. Anonymous play shouldn’t be allowed. I had no idea I’d lose 4 months of work and a good bit of money if I didn’t create an EA login. Not happy! I have exactly the issue you describe. My Springfield is lvl 59 and when logged in via my account i get the lvl 1 startup cutscene. After this it looks like a lvl 1 spring field but im still lvl 59 and have all my donuts. Everything else is gone, characters, money etc. I tried to solve this through the steps described in your post, thing is, when i made the pavment after building the simpson house, my game crashes saying “i really hate this screen”. When i get back in the cutscene happens again and i have to start all over. I’m reinstalling it right now so hopefuly it has worked! Rly good to know my town isnt lost aswell, thats a relief. hi! i have to reset my tablet and i don’t know if i can go back to my springfield due to all the information in the tablet was erased. i used to work without an origin account, like a guest. thanks! 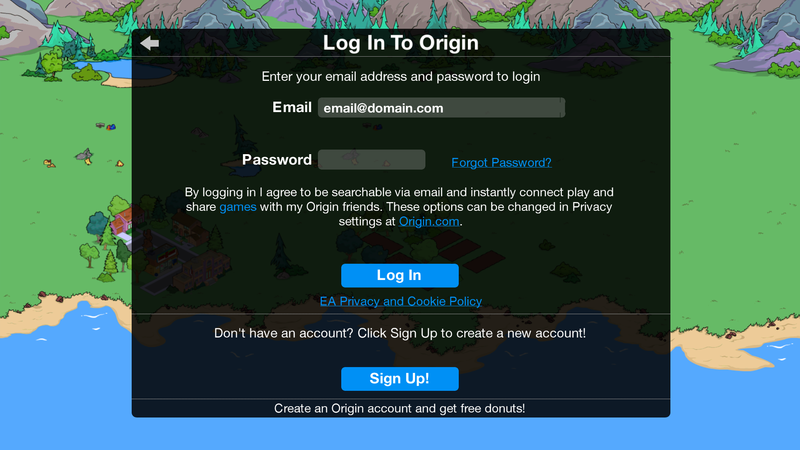 If you don’t have an origin account most likely your Springfield is gone. You can try contacting EA and see if they can restore it, but odds are it’s gone. Did u ever get your town back if so how? Thanks. .I uninstalled my game and reinstalled it and it brought it back to my level 59.. after much heart attack feelings. . I feel much better now. My account is logged in origin at level 40 on the splash screen but when I play it starts at level 1. Do you suggest I log out then play through till I can log on on the friends screen? If it does not… try to go out, uninstall, reinstall… then try again. I have done that and it says you have a Springfield on another device however I only play on 1 device? It is just a default message. It means you left the game too soon and it thinks you are still inside. Just continue and play anyway. I see it all the time. Hi! I am having this very frustrating issue today. How can I fix it without an Origin account? I have not had and do not want to have an Origin account as sharing your personal data with anybody is not wise. Yet the game still worked and saved my progress every day without any issues.up untill today. Please help if you can. There is nothing we can do if you did not link your game to an Origin Account. It is the main way to track your account in the EA Servers with the BILLIONS of other Players they have. Without that link, you are playing at your own risk. Sorry. Try to reach out to them to see if they can help trace it, but… as we have seen time and time again… needle in a million haystacks. Good Luck. Hi! Thanks for your response :-). 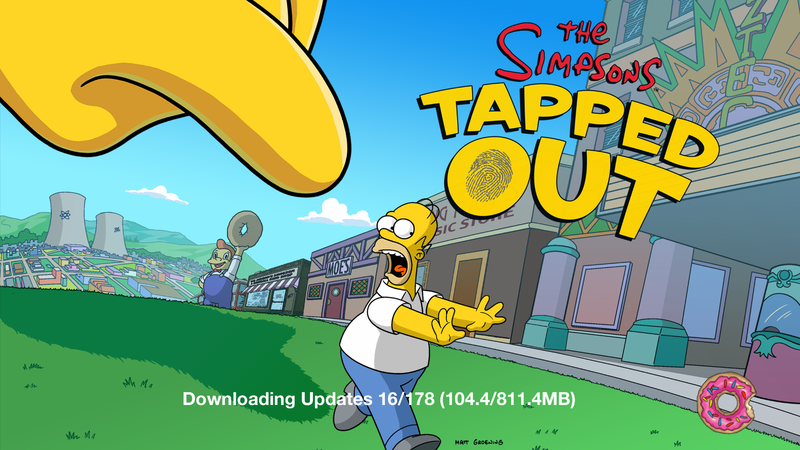 I managed to restore my Springfield without bothering EA ;-). I was going to remove the app completely and reinstall it, but I just removed all locally stored data of the app (or “cache” – whichever term is better ;-)) and opened the app. 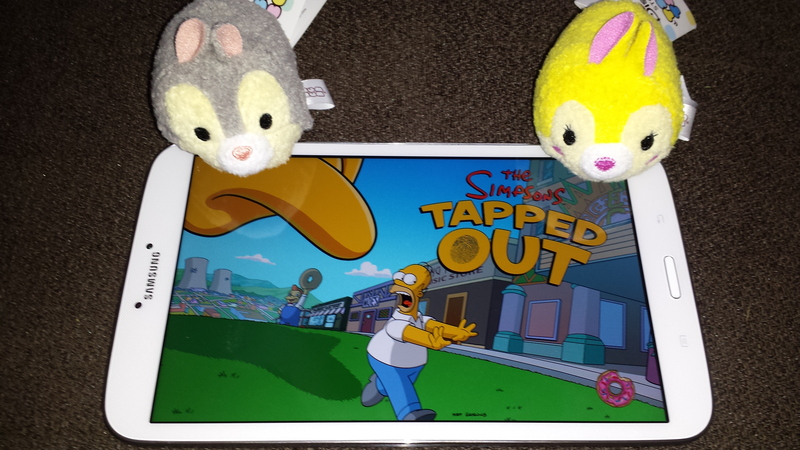 After around 10 minutes of downloading everything, my Springfield was back with me safe and sound :-). Anyway, I am thinking about signing up to Origin. Maybe it is not such a bad idea and it will give make my Springfield a safer place ;-). 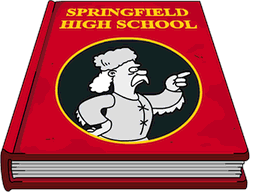 But having a 15-level Springfield is it safe to sign up to Origin now? Or will I have to start all over again ;-(? You should be fine. I’d suggest doing it soon. Has anyone ever had this issue? I created my TSTO through my FB account, and while I do know the email address, and even the Origin ID i dont remember the password, hpwever the email in the game is an outdated email. What options did you select when you went there? If you can, go through the “Origin” issue portion and try to trigger a phone call. Well….we’re not EA so we can’t rectify it. Only EA can. However, try logging in from another device, that usually helps bring your game back. Otherwise contact EA and let them know, they can restore it for you. Hard close and restart TSTO. You should be able to log into your game there. 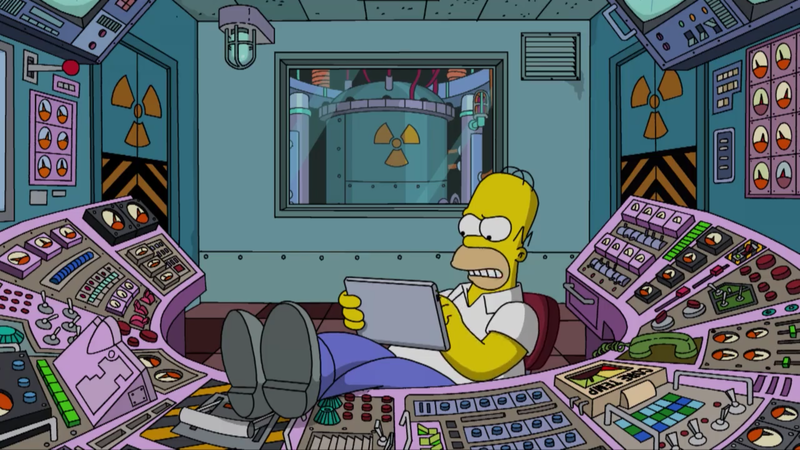 If that still doesn’t work try using another device to access your Springfield..that should bring yours right back up. It happens to me every so often, usually hard close works for me. I’m back to level 1, I didn’t log out, I am logged in, I tried all your tips, nothing works… to level one from level 50, and money spent, is this some kind of twisted joke?!?!?!?!!?!?!?!?!?!?!!?! No it happens from time to time. Did you hard close and restart your game? (remember hard close involves actually closing the running app, just just returning to the Home screen). If that doesn’t work you can log into your game from another device, that will kick it back to place. If you can’t do that next step is to contact EA, they’ll be able to trigger it back. As long as you have an Origin ID saving your game it’s not lost. Thanks for this write up. Panic mode started to set in. 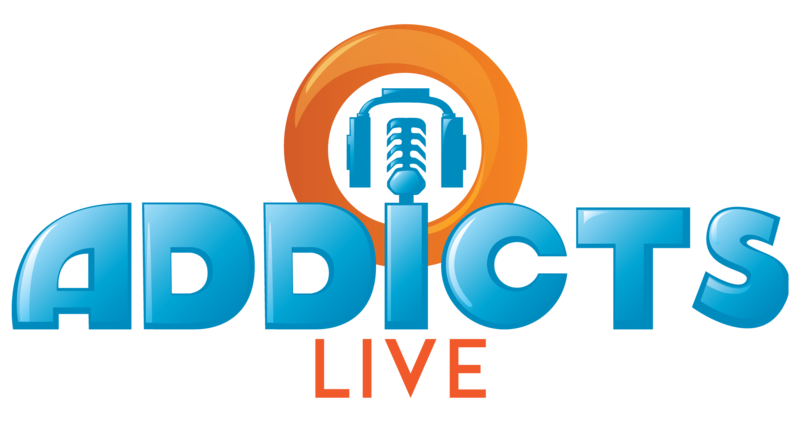 Three hours left on writers building, almost have the UBO, and about to level up and get some free donuts….but I thought I bet TSTOaddiscts can help and you did, so panic squashed! All back to normal. Thanks again guys! Thank you so much for your help – I was on level 30 and went back to level 1! Your troubleshooting tips saved the day and I’m now back on track. My B game is messed up. It keeps restarting to the opening video (from lvl 44). I switch between my A and B games so I am logging out and back in so that isn’t it. I have also reset my kindle and force stopped the game a few times. Once it plays the video, I can get as far as Lisa cleaning up the area before it loses connection and when it reconnects I am back at the opening video. 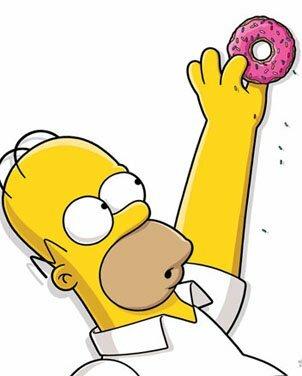 If I don’t do anything with Homer when it starts, it just resets and goes back to the opening video. If I visit my B game from my A game, it looks fine. Not sure what else to try at this point. I’m having an issue where when I sign in, I’m sent to another user (samzettel8441) but I’m actually ralpspiggys. I’ve tried to contact ea but I have no response! Please help!!!! EA is your best bet for this, however you can also try to uninstall TSTO from your device, restart your device and reinstall it. That could help to clear it. If not….EA is your best bet. Try contacting them after 8am CDT, usually there’s phone support around at that time. Unfortunately there is no way to recover your town if it was not linked to origin. If you lost premium stuff, get an origin account and you can try to see if EA will help you out at all. Not sure what they’d say but I know you can prove donut purchases through your app store history so there’s that at least. Hmm… Well, I got an EA account to contact them. They (predictably) said nothing could be done. However, when I reopened the app and logged in w/my new account name, it said there was already a lvl 44 game associated with my device. It asked if I wanted to view it, I said yes. There was my long lost town! It asked if that was my springfield, I said yes. It tied my old town to my new account! (So, if this happens to you, def don’t uninstall the app!) Now next my acct name it says 44, my lvl. However, logged in or not, it still starts over at the level 1 animation. I’ll ask EA, but any suggestions from you lovely bloggers? When you log in, it’s supposed to start you where you were. If it doesn’t do that, only EA can sort it out. Good luck! I’m glad you at least know your town still exists.